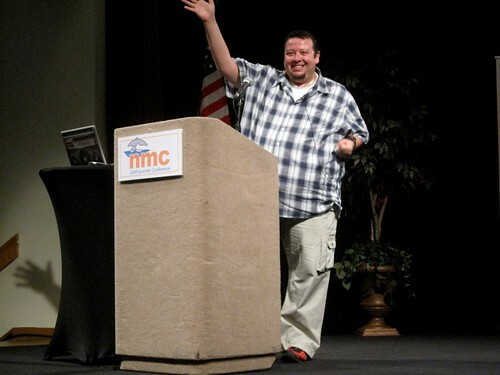 Marco Torres provided the Friday keynote for the 2009 NMC Summer Conference in Monterey, California. Marco Torres has been recognized locally and internationally for his accomplishments in the classroom, creative program building, administering complex budgets, and for the use of technology to empower minority students. Once referred to as "Jaime Escalante.com" by Mr. Escalante himself, Torres is empowering students, teaches them how to celebrate their culture, build communities, and how (and why) to use multimedia tools to share their very special stories and ideas with the world. It's about teaching and learning. Or, learning and teaching. In this "flattening" world, we are required to be more creative, more flexible, more community based. However, teachers -- the world still needs GOOD, empathetic, ingenuous educators, a teacher, a Yoda! Yeah, you! The kids, more than ever, need us! Multimedia is a language to our students. If we're smart and ready, we can use it to be very academic and very rigorous (and have fun along the way, too). If we use multimedia right, we can empower in ways that we never imagined. Turn your classroom into a stage, a studio, and a community and HURRY! The kids are waiting for you to catch up! Sorry, the flash media seems to not available.